Recipe courtesy of the American Lamb Board. 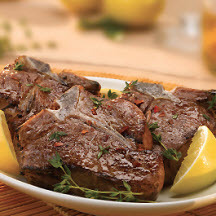 Rub chops with oil and season with dusting of lemon pepper on both sides. Grill chops on medium heat for 4 to 5 minutes per side for medium. Recipe and photograph courtesy of the American Lamb Board.